16/4/19 The first match in the Club Championship has been completed. Adrian predictably beat Pete and is in the semi-finals. 9/4/19 There were only 8 entries for the Club Championship this year, so there are now 6 whole weeks between final dates for each round. See left-hand menu for details. As there were no first-round byes, late entries can not be accepted. 4/4/19 John Edge has won the BDCL Open Individual championship! 31/3/19 Halesowen results at today's BDCL Rapidplay championships are in the individual results section. Don won the Minor! Also, Reg Beasley table as of end of March now available. Keith Arkell has the highest percentage but can't now win as he can't play 11 games. John Davis leads amongst those who can win, but 7 players have over 60%. 27/3/19 Another quick win! Alas not quite quick enough, but still less than 10 moves. See Mark Bethel's win with Black in the New Games section. 22/3/19 Only 8 entries for the Club Championship so far. This is not Brexit, folks! The entry deadline will not be extended. Bushbury have withdrawn from Dudley Division 2, so the match on Thursday 28th has been cancelled. 13/3/19 Was this the quickest win this season? A mystery. See New Games. 10/3/19 AGM will be on 21st May. 8/3/19 Wolverhampton Div 3 team has won promotion and stands a good chance of winning the division. 1/3/19 New Reg Beasley table is out. Keith is still top, but has only played 5 games. Tony Stokes leads those with 11 games or more, but there is a whole pack of players over 60%. All to play for! 22/2/19 New game from Stewart (See New Games). In his words "I played this game at Worcester on Thursday (14th). It's not a great game, but I was amused when I realised that the attack I played had only really involved 3 pieces. It's not unusual to leave the QR and QB at home in this variation, but in this game I never moved my Q at all! And if W hadn't resigned my two knights would have ended on e1 and d1. Must be an oddity of sorts." Also, John Edge has reached the final of the BDCL Div 1 Individual yet again (10th time by my calculation), and he's already won 7! 13/2/19 First title of the season! Congratulations to the Dudley Division 1 side. They can only be caught on points by Warley Quinborne, and then the title is decided on the result between the two teams, which favours Halesowen. 23/1/19 January grades are out. This site will be updated in the next few days. 17/1/19 John Southcote will be visiting the club on Thursday 24th. 9/1/19 Latest Individual Results and a new exciting game finish by John Edge (which he ended up losing). See left-hand menu. Just over halfway through the season our best chances of honours are BDCL 4, WDCL 1 and 3, Dudley 1 and Worcs 1 and 2. 27/12/18 Keith's best game from the London Chess Classic is in New Games. Includes a Queen sac! 20/12/18 Merry Christmas and a Happy New year! 19/12/18 New entry for Quick WIn Trophy. John Edge won in 6 moves! See new Games. 18/12/18 See Individual Results for some amazing news! 4/12/18 A warm welcome to our newest member John Watson. I've sent him email addresses of all relevant captains. 1/12/18 Latest Reg Beasley Table is out. Malcolm is in a clear lead. There was a presentation to our departing secretary on Thursday. 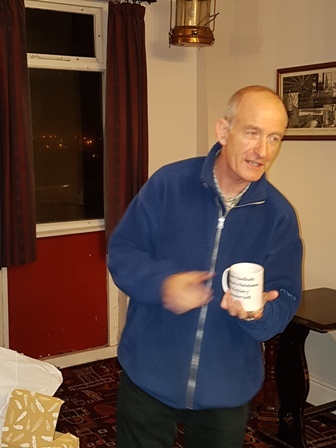 Photo of John with mug and gifts. The mug features his recent famous win. 25/11/18 New game by John Edge in the New Games section. See Individual Results for Finlay, Manvith and Silas's latest success. 23/11/18 Our very own GM Keith Arkell is playing in the World Seniors (over 50) championship. At present he has 4/5, half a point behind the leaders in an 11-round tournament. Final details will be in the Individual results section. 21/11/18 John Southcote's leaving do went well. Here is a picture of him with Ronald Colman, and one with some random tramps in Wetherspoons. 15/11/18 Two matches won tonight means that as a club we have more wins than losses for the first time this season! 6/11/18 Going out with a bang! John Southcote played black on board 1 in B'ham Div 5 and mated his opponent in 9 moves. This is the first entry for the Quickest Win Trophy. If you can beat that at any time in the season, let me know. UPDATE! The game is now in the 'New Games' section. 27/10/18 Latest Reg Beasley table is out! Keith Arkell and Paul Taylor lead, but Dustin Bowcott leads among those who have already played the requsite 11 games. The display of the Fixtures list has been improved, and next week's fixtures are now at the bottom of the Home page. Thanks to Don and Stewart for suggestions. Look out for more exciting changes yet to come! 21/10/18 We had good representation at the BDCL Rapidplay today. See Individual Results for details. Also, there have been a number of rearranged matches and another postponement. See Fixtures for details. 11/10/18 Fixtures and Results updated again with a rearranged match. Also I've added a little table to show how each team is doing. This isn't one of our better seasons. 6 wins in 25 matches so far! 29/9/18 First Reg Beasley table is out. 6 people are on 100%, but of those only Malcolm has played more than 1 game. All Fixtures and results so far are up to date as well. 19/9/18 2 draws and a loss last night. Also more individual successes for our juniors. See Individual section. 14/9/18 2 wins out of 3 last night. We're up and running! Also Stafford have moved again to The County Staff Club, 77 Eastgate Street, Stafford ST16 2NG. 12/9/18 3 more matches last night and we finally got a win! Unfortunately it was for Dudley 3A v Dudley 3B, so we've still yet to beat another club after 6 matches :-( Let's hope tomorrow's 3 matches bring some success! 7/9/18 Another loss, this time in WDCL Div 3. My fault, but it was good to see Maureen win her second game back. 5/9/18 The first two results are in (out of about 160 this season). Both losses unfortunately. There is a new link on the Fixtures page to allow download of an Excel file with sortable columns. by request of Paul Evans. The finish of my latest loss is in the New Games section. Quite amusing. Any good, interesting or amusing games or parts of games always welcome (pgn format preferred). 3/9/18 There has already been a change to BDCL fixtures affecting Divs 4 and 6. See Fixtures section for details. Also, want to know what teams you're in next year? Look here. Is this guy good or what? 1/9/18 League time limits for 2018-19, per John Southcote's email are here. 29/8/18 Club Championship Final ended in a draw and there was no time for a quickplay replay, so the title is shared by John Edge and Finlay Bowcott-Terry. Honours even between the generations! 23/8/18 Dudley League fixtures now in. Just Worcester League to go! They're cutting it a bit fine. 22/8/18 There have been a couple of fixture changes affecting Bham 1 and 6. See fixtures section. 14/8/18 Buzzer tournament run and won by John Edge. 18 people played. Adrian Priest was 2nd again. Grading prizes were U-140 shared by Paul and Don, and U-100 shared by Dave Roberts and Maureen. Good fun all round. 7/8/18 The final of the Club Championship will be between the many-times winner John Edge and the up-and-coming star Finlay Bowcott-Terry, after Finlay beat Paul Evans in the semi-final tonight. Will the fading old champion repel the young upstart? We will have to wait and see! Also, thanks to all the dedicated club members who helped with the equipment audit tonight. And to those who didn't - we know where you live! 5/8/18 Yet another club have moved. Stafford are now at Stafford Constitutional Club, 5 Lloyd St, Stafford ST16 3AS. They play upstairs. 31/7/18 Comedy simul tonight. Stewart and Malcolm played 17, W12 D2 L3. One of the draws was against me when Malcolm took pity. My grandsons, Daniel and Nathan enjoyed it even though they lost. 26/7/18 New grades are out! See ECF site or on the left for our grades. We have 12 players in the top 100 lists altogether, comprising all 3 Arkells, the Bowcott-Terry brothers, Manvith, Stewart, Malcolm, Don, Joyce, Tony and of course me! They are summarised here . Also, another change of venue - Redditch CC now at Alvechurch Sports and Social Club, Radford Road, Alvechurch, Birmingham, B48 7LD. Not in handbook. Please note. 25/7/18 The Tony Evers match was held last night. We lost as usual. The score was 4.5-9.5. The only winners were Martyn Hathaway, Paul Taylor, Joyce Evans and Chris Haddon. It was good to see Paul and Maureen Clark returning to the club. 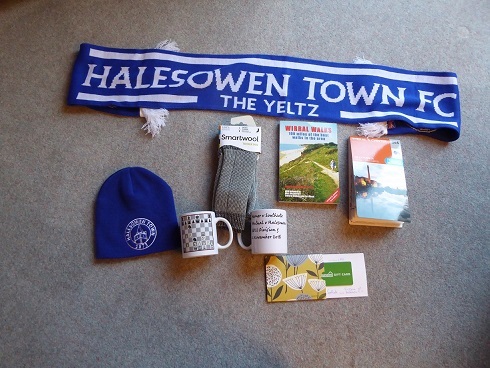 A raffle raised �54 towards club funds. 18/7/18 A buzzer night was held last night. Great fun. Stewart organised and won. Adrian was second in the top group. The second group was a 4-way tie between myself (Pete), John S, Chris Lees and Don, who got lucky against me. Everyone won at least one game. It was good to see both Chris and Maureen Clark making reappearances after some years (over 20 in Chris's case). Results in individual tournaments have been moved to a new section on the left. 27/6/18 Halesowen beat Mutual Circle in the B'ham Summer League last night thanks to Joyce, who won one of her games against an opponent graded 68 points higher on standard grade! 26/6/18 Also, Wolverhampton League fixtures are now available on the left. 19/6/18 Keith Arkell gave a simul and won 14-0. He said that the best game against him was by Manvith. My own contribution was overlooked for some reason. 18/6/18 Windsor Peck died peacefully in his sleep on July 15th. He had been a valued and popular member of the club for decades and continued to play for us even after he moved to Telford some years ago. His last appearance was in the first round of the club championship a couple of weeks ago, which he won. He will be sadly missed. 12/6/18 First Summer event - Ade and Dale gave a comedy simul and ran into an ambush by 3 Div 1 players amongst others. Result W3 D3 L7. Great fun! 3/6/18 Archive, History, Contacts and Fees have been updated. Link to Minutes of AGM here. .
30/5/18 There was a BDCL Summer League match against Wolverhampton. 1 won, 1 lost and narrow loss overall. Also, Windsor beat Joyce to go into the second round of the club championship, and Dave Roberts drew with Tony Stokes. 27/5/18 Summer Events are now available in the left-hand section of the screen. 12/5/18 Preliminary round of the Club Championship is complete. First round matches to be played by June 19th. Also, the final Reg Beasley table has been updated with the tables of who has played the most, won the most, etc. These will now not be given out at the AGM. 27/4/18 The season is over, Dudley 2 should be at least Runners-up in their division. Keith has won the Reg Beasley. Club Championship has started with at least one game being played next Tuesday. See the menu on the left for details. 19/4/18 Worcester Div2 has been won! Dudley 3b are Runners-up. Well done everyone. 6/4/18 Date for the AGM is 22nd May. Try to attend or risk being elected captain of something in your absence! Club Championship will start before the AGM and we have 6 entries so far. Please sign up by 20th April by emailing me. It's open to all paid-up members including social members. Congratulations to Finlay for becoming Warwickshire U-14 champion to go with his Worcester U-14 title. 30/3/18 Reg Beasley table has been updated. Keith is unstoppable now unless he plays in and contrives to lose his last possible 3 games. A bit unlikely! Dave Etheridge is flying the flag for the lower divisions. Finlay stays just ahead of his dad, and of course I am miles ahead of Don (a whopping 2%). 22/3/18 Latest league situation: Worcester 1a winners, Worcester 1b in danger of finshing bottom and possibly relegated, but have two matches left. Worcester 2 have finished their matches, but could win the division if Stourbridge lose to Kidderminster on April 18th. BDCL No team will be relegated or win their division, but Div 4 still have a very slim chance of being promoted if results go the right way. Wolverhampton League Div 1 has been won! Div 2 could still get promoted if they win their last match and Kidderminster implode. Div 3 will be mid-table and Div 4 bottom. Dudley League Div 2 and 3 could still be won, but are reliant on other teams slipping up. 13/3/18 Dave Bissell visited but unfortunately left before a couple of people who had been playing an away match rushed back to see him. Shock news is that he beat me in two friendly games :-) . He drew a blitz game with Nick. The Worcester Division 2 side finished their season with a win, and could win their division. It all depends on the result of the last match of the season between Stourbridge and Kidderminster. BDCL div 5 lost again. To be certain of staying up they need to win one of their last three matches. 4/3/18 First trophy of the season! Worcester County 1 has been won for the 4th year in a row and 15th overall. It's the poshest one we compete for as well! 28/2/18 The latest Reg Beasley table is out. Keith is still in the lead and Malcolm is the only likely challenger, but he still hasn't played the requisite 11 games. Will he get back from gallivanting round the world in time to win a couple more games? The nation holds its breath. Our teams are leading Worcester and Wolverhampton Div 1 and Dudley Divisions 2 and 3.UPDATE 1/3/18 2 adjournments were agreed before 1st March, so Reg Beasley table has been updated. 1/2/18 New Reg Beasley table is out. Keith remains clear at the top. All results up to date. We're still in the running for several trophies. 31/1/18 The BDCL Div 1 match last night was cancelled, so Dale organised an impromptu time handicap blitz tournament. Keith only had 1 minute + 2 seconds per move! It was won jointly by the Arkell brothers but there were a few surprise results, notably by Tony Taylor who beat Malcolm in one game. As Keith only drew one of his games against Malcolm does that mean Tony is the best blitz player in the club? :-) Anyway a great time was had by all. 26/1/18 The ECF grading site has lists of the top 100 players in various categories. We have 11 players in the lists altogether, including our strongest players, juniors and some old lags like me. They are summarised here . Obviously I only bothered with this tedious task because I'm in the list! Now updated for extra age groups. Keith is 3rd in the Over 55 list and we have an additional player. Don Curry is the 77th most active Over-65 Rapid player in the country. Glory at last! UPDATE 2 - Joyce is in the top 100 female players in every age group over 50, and is 3rd in one. 24/1/18 New grades are out. See Members section for details. Readers may or may not be pleased to know that I have temporarily halted my headlong decline into imbecility and death. 11/1/18 We have now completed just over half the matches for the season. Best chance for honours look like Worcs Div 1, Wolverhampton 1 and 2 and Dudley 2. One or two teams are in danger of relegation. Also, Paul Evans has broken my record for most miles travelled by mistake. I once went to Mercia instead of Mutual Circle, but Paul went to Lichfield when we were playing at home. He got back in time to play as well! Congratulations on the new record. 26/12/17 Matches are over for the year. The new Reg Beasley table is out. Keith is still in front, closely followed by Malcolm. But will Malcolm play enough games? 5/12/17 The ECF Club of the Year trophy was presented by Dave Thomas. There was a very good attendance considering the short notice. Click Stewart, juniors, trophy, and members for pictures of the evening. 1/12/17 Keith is the new leader in the Reg Beasley trophy. Next Tuesday, 5th December at about 7:30 there will be a short presentation ceremony of our ECF Club of the Year award. Try to come along even if you're not playing that night. If you can't make 7:30 come along later to see the award (whatever it is).